Summary: Although attention to photovoltaic (PV) power generation by solar cell is rapidly growing in recent years, PV electricity is still far below the grid parity level in cost and 1 % share in energy supply. The most promising way to reach the ultimate solution of global energy and climate change is presumed to exist in the paradigm shift in the global energy production/transport system from the current fossil fuel/tanker base to the nature-dependent steady (renewable) energy/superconducting network base. 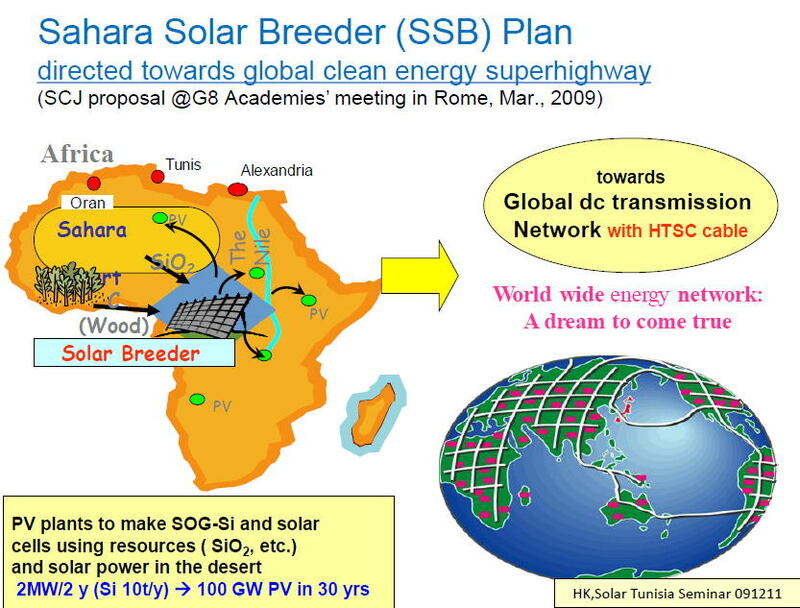 In view of the world energy needs in future, potential solar photovoltaic capacity, and recent progress in high-Tc superconducting cable technology, Science Council of Japan proposed the "Sahara Solar Breeder (SSB)" plan at the G8+5 Academies' meeting in Rome (Mar. 2009) to provide the paradigm shift and to open the real sustainable energy age in the world . The SSB plan contains the following core technologies to be developed and deployed. 2) System design and materialization of PV interconnection to HTSC grids. 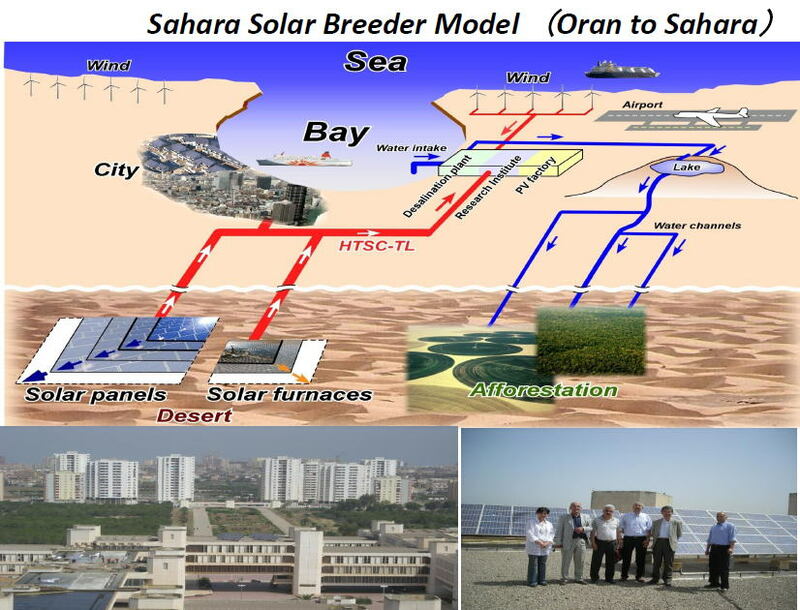 The dream of SSB plan is going to start the initial stage in "Sahara Solar Energy Research Center" (SSERC) project coordinated by The University of Tokyo (TU) and University of Science and Technology of Oran (USTO) . In addition to this basic research project (about a 5 M$ grant from JICA/JST for 2010-2015), a new scheme is indispensable to reinforce and extend this initial project to the next stage of making SSB dream come true. SSB foundation (SSBF) is proposed for the purpose of promoting the shift from SSERC academic research to an industrial and economic reality which would be beneficial for African countries . 1) Harnessing the 3rd value of the desert for energy: Large scale/low cost production of solar-grade silicon from desert sand. 2) Solar breeder: Construction of solar cell plant doubling its scale every energy payback time (1-2 years at present). - Sahara initiative: SSERC project to start from 2010 by partial support of JICA/JST program on "Sci. & Tech. Res. Partnership for Sustainable Development". Science Council of Japan (SCJ) presents the above titled topics for proposing international collaborative R&D to treat the global energy and environment problems. This is a long-term plan ranging from basic research on solar photovoltaic (PV) materials and devices through the design and business plan for industrial production of solar cells to breed or amplify into a large scale solar power station. 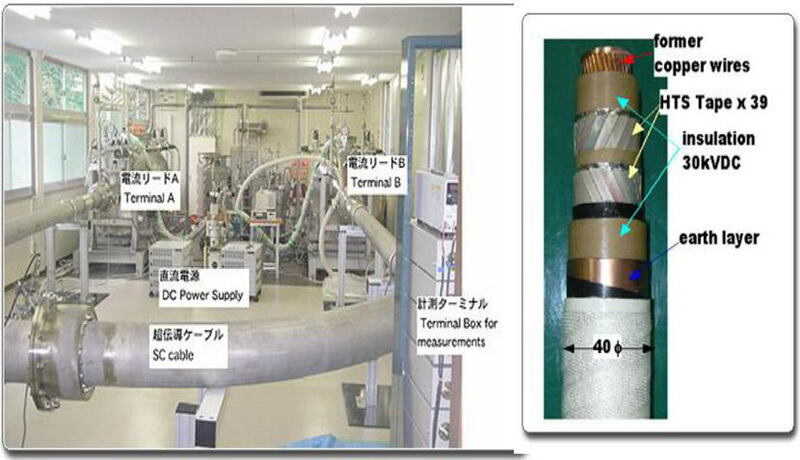 Also planned is R&D of dc electric transmission by high-Tc superconductor (HTSC) as a new technology for long distance low loss electric energy transmission. Sahara desert and its vicinity is presumed to be appropriate site for this solar breeder construction, because the desert has a plenty of silica as primary material for silicon and of sun shine as solar energy source. Sahara solar breeder (SSB) is composed of two parts: solar grade Si production that should be started from basic research and Si solar cell manufacture plant that will be constructed and operated by bringing in raw materials and machines at the start-up. Starting from 2 MW scale in 2012, PV station is planned to grow up to 1GW in 20 years. In parallel to this PV factory, a transmission line using high-Tc superconductor (HTSC) wires is constructed to test the feasibility of long distance transmission of PV electricity generated by the solar breeder. Recent remarkable progress in HTSC wires (cooled by liquid N2) is making it possible to transmit large electric power with much less loss than by the current Cu wires. Research Institute for SSB is established in Africa as the key station of SSB where the technical plan is designed and controlled so that smooth coupling of PV-HTSC fundamental research and industrial development could be achieved among project partners. Our goal is the global clean energy super highway connecting GW scale PV power stations located at various desert areas with HTSC transmission lines. Tentative specification and roadmap of SSB plan are outlined as follows. 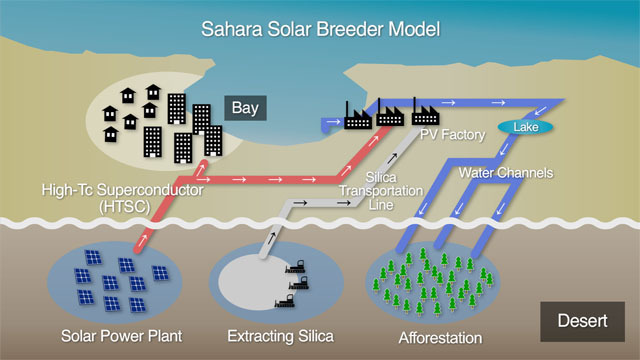 Figure 1 illustrates Sahara solar breeder plan directed towards global clean energy super highway. Fig 2. 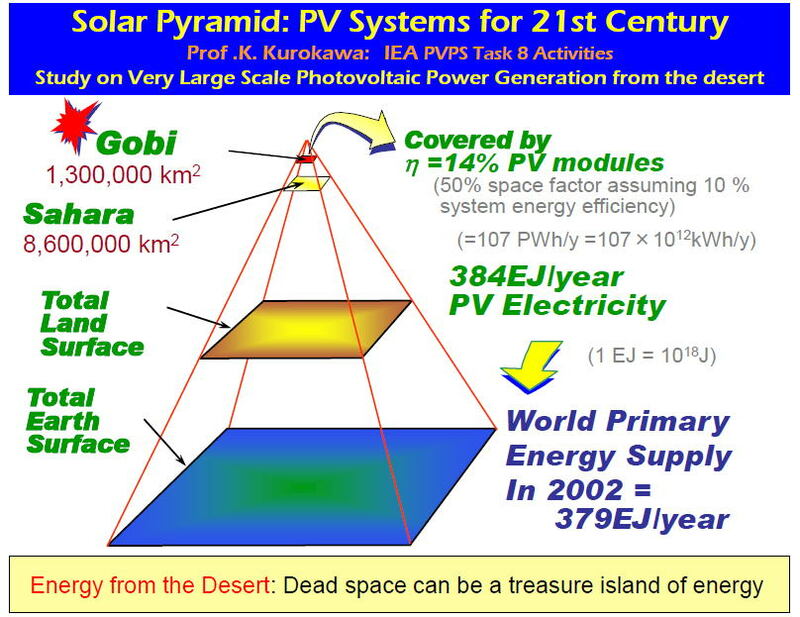 IEA-PVPS's "Energy from the Desert" activity (since 1998) report edited by Prof. K. Kurokawa et al. 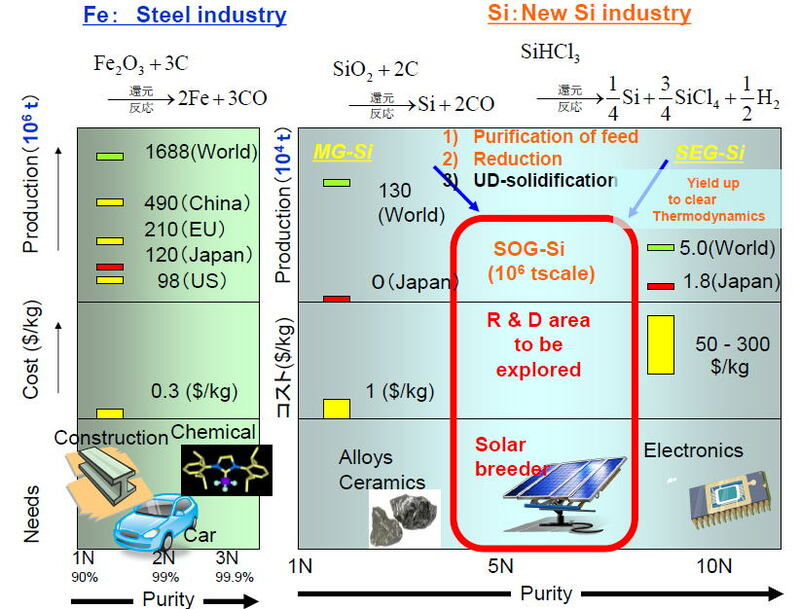 Let's think how to scale up Si production as much as steel ! SSB Plan for future of space ship "earth"
Fossil fuel / pipe line, tanker -> PV ＋ HTSC Hwy.